Overview Government mandates require modern handheld trimmers and other twostroke equipment to produce less exhaust emissions. To comply, some original equipment manufacturers (OEMs) design their equipment to run on leaner fuel/oil mixtures. Burning more air and less fuel/oil, however, also increases heat. To withstand this intense environment and ensure equipment lasts as designed, modern two-stroke oils must demonstrate improved wear protection and detergency. Objective Demonstrate through lab testing that the latest generation** of AMSOIL SABER® Professional Synthetic 2-Stroke Oil exceeds the increased performance needs of ECHO* string trimmers in particular, and modern two-stroke string trimmers in general. 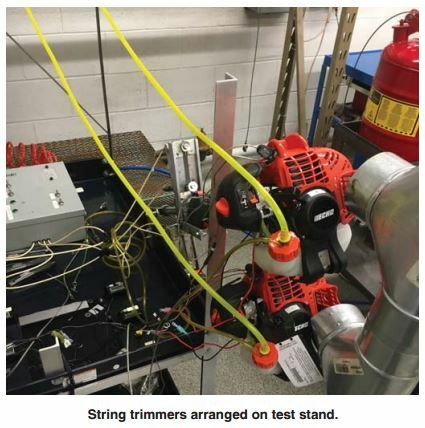 Methodology Testing was conducted on eight ECHO trimmers in the AMSOIL mechanical lab and followed a test plan designed to compare two-stroke oils in simulated real-world conditions. Test duration is designed to simulate an extended length of service. The OEM’s recommended 50:1 mix ratio was followed. SABER Professional was installed in four trimmers and ECHO Power Blend was installed in another four. Computer-controlled actuators operated the trimmer throttle triggers according to an identical protocol for each unit. Images of trimmers arranged on the test stand are included for reference. 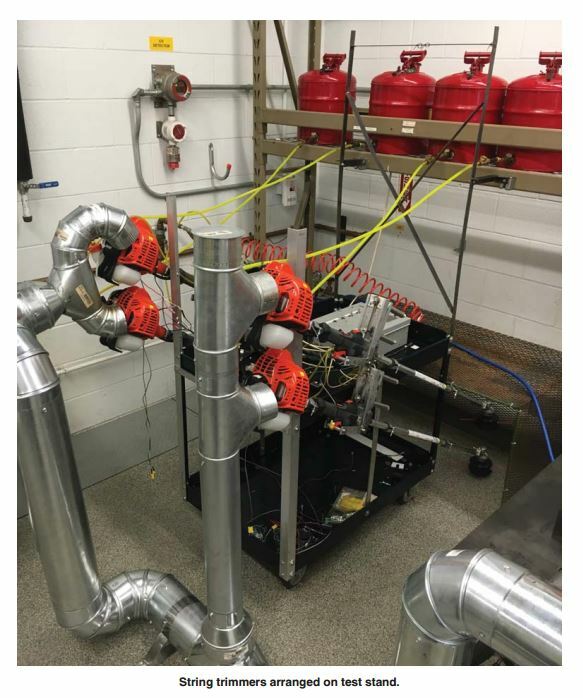 Test administrators monitored engine rpm, spark-plug temperature, exhaust emissions and other parameters to ensure consistent, repeatable operation and gauge overall performance of each trimmer. After 300 hours of operation, the trimmers were disassembled and inspected. Note: Test results published in this Technical Study describe and represent properties of oils that were acquired on the dates listed in Table 1 on the facing page. Results do not apply to any subsequent reformulations of such oils or to new oils introduced after completion of testing. All oils were available to consumers at the time of purchase. Testing was completed in July 2016. 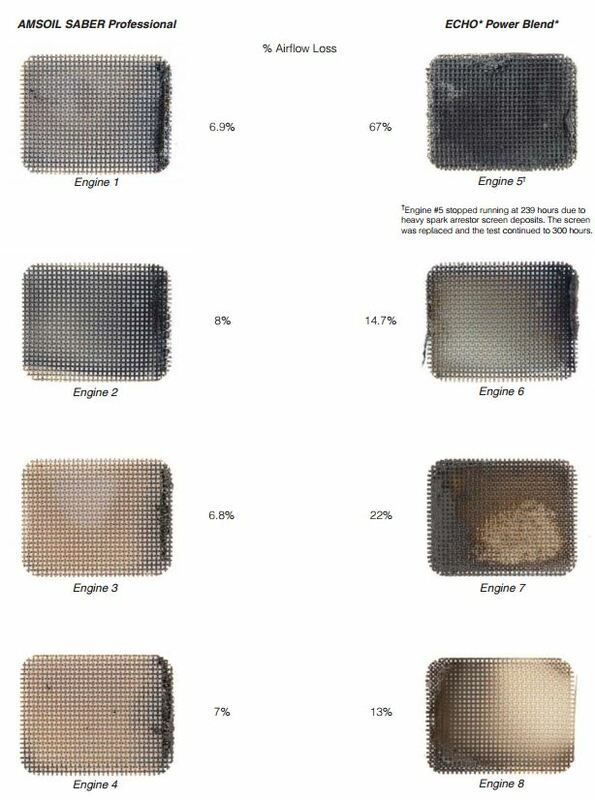 The differences in effects between AMSOIL SABER Professional and ECHO* Power Blend* are statistically valid at the 95% confidence interval for exhaust port blockage and spark arrestor screen plugging. 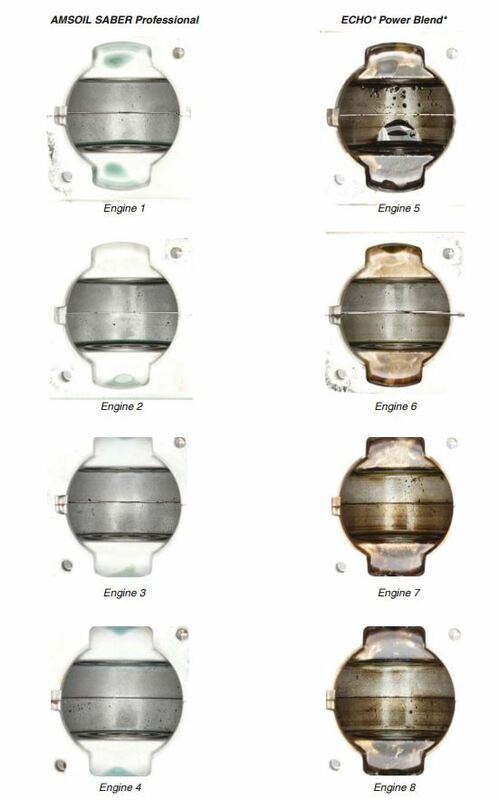 The carbon buildup on pistons was not numerically quantified as part of the study. Deposits in the ring grooves can cause the rings to stick and lose effectiveness. Engine rpm can decrease and the engine cab lose compression. Significant compression loss leads to engine failure. Heavy deposits on the piston skirt increase friction and reduce performance. Deposits appear heavier on the pistons lubricated with ECHO Power Blend. The pistons lubricated with SABER Professional appear cleaner. SABER Professional provided improved detergency and extreme-heat resistance. Both oils guarded against piston ring sticking well. 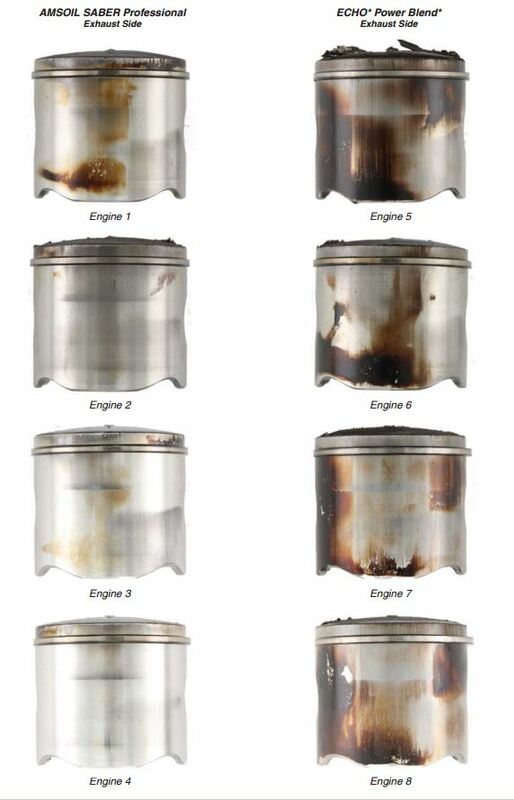 Piston Crowns/Undercrowns Heavy piston crown deposits can cause preignition and poor performance. While undercrown deposits are unlikely to impede performance, they are an indicator of the oil’s detergency properties. With modern two-stroke equipment running hotter, oils must demonstrate strong detergency and heat resistance to maintain piston cleanliness and peak performance. Pistons lubricated with ECHO Power Blend appear to contain heavier crown and undercrown deposits. 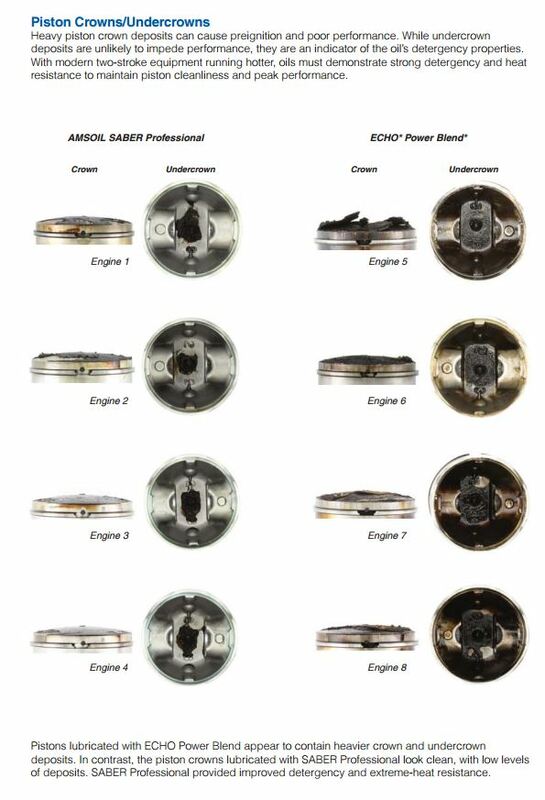 In contrast, the piston crowns lubricated with SABER Professional look clean, with low levels of deposits. SABER Professional provided improved detergency and extreme-heat resistance. Wrist Pins & Bearings The wrist pin and bearing are exposed to extreme heat due to their proximity to the combustion event. Ineffective lubrication can result in deposits, polishing and flat spots on the wrist pin restricting rotation. As the engine works to overcome this restriction, the piston can bear increased pressure, leading to scuffing and eventually failure. All eight wrist pin bearings demonstrated no issues throughout the test, indicating the oils provided good protection. None of the wrist pins contain flat spots. Both of the oils performed well in this area. For the engine to run properly and produce maximum power, exhaust gasses must flow freely out the exhaust port during operation. Restricted exhaust causes RPM and power loss, starting difficulties and eventually, failure to operate. SABER Professional demonstrated low exhaust-port deposits. In contrast, all four exhaust ports on the engines using the ECHO product suffered blockage, with two more than half blocked with deposits. Note: Airflow loss was calculated using a flow bench to measure restriction which was converted to a percentage of flow compared to an unblocked exhaust post. Exhaust gasses continually flow through the spark arrestor screen located on the muffler which is prone to plugging. Like the exhaust ports excessive deposits on the spark arrestor screen restrict airflow and reduced power. SABER Professional demonstrated low spark-arrestor screen deposits. In contrast, screens on the trimmers lubricated with the ECHO product contained higher levels of deposits. The screen from engine 5 was nearly completely blocked with deposits after 239 hours of the 300-hour test and required replacement. On average screens from engines using ECHO Power Blend suffering 4X more airflow loss than screens on engines using SABER Professional 2-cycle oil. Note: Airflow loss was calculated using a flow bench to measure restriction which was converted to a percentage of flow compared to an unblocked spark arrestor screen. The main bearings receive little lubrication given their location in the lower end of the engine. Deposits are an indicator of poor oil detergency. Heavy deposits can restrict bearing rotation and eventually lead to failure. 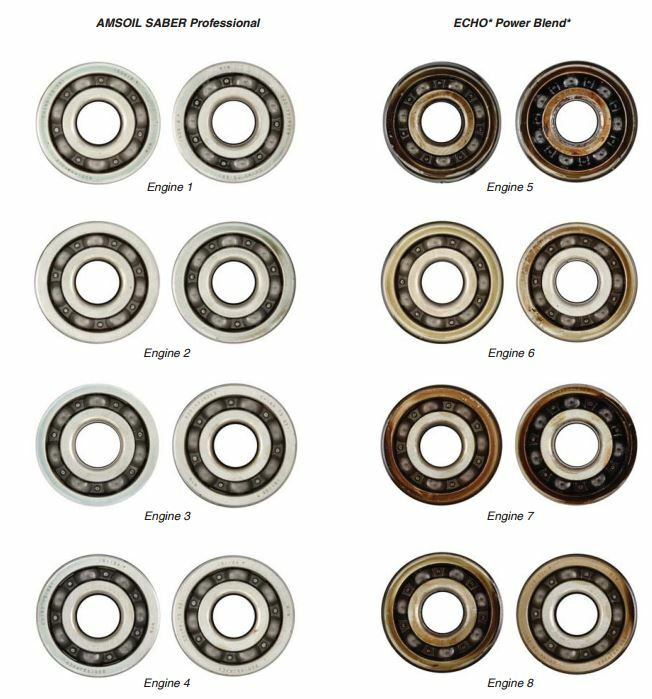 The bearings lubricated with SABER Professional appear to contain fewer deposits. 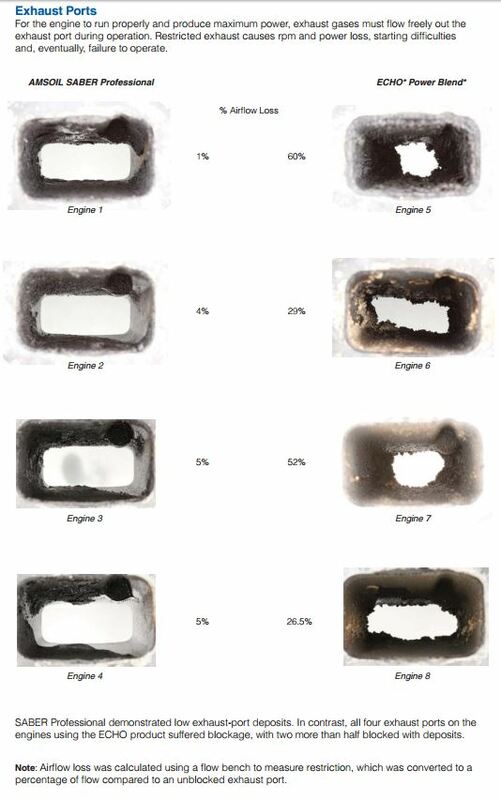 Oils with ineffective detergency properties can allow deposits to accumulate in the crankcase. During operation, deposits can circulate throughout the engine and reduce performance. Crankcase deposits look heavier in the engines using ECHO Power Blend. The engines using SABER Professional appear clean and free of harmful deposits. Reduced rpm and spark-plug temperatures are indicators the engine is producing sub-optimal power. This can be caused by heavy exhaust port and spark arrestor screen deposits which restrict air flow through the engine and result in reduced power. 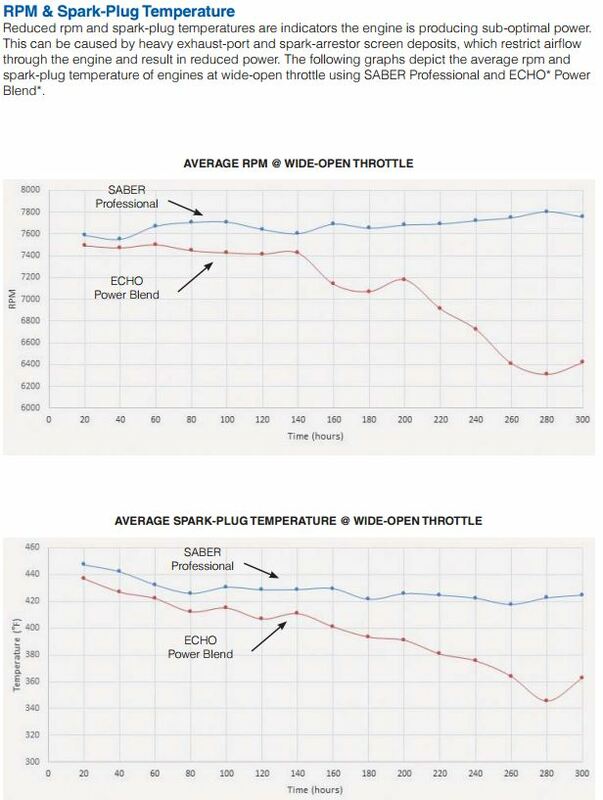 The following graphs depict the average rpm and spark-plug temperature of engines at wide-open throttle using SABER Professional and ECHO Power Blend. Engines using SABER Professional maintained consistent power throughout the study, while the average spark-plug temperature declined slightly. In contrast, the engines using ECHO Power Blend slowly lost power as the study progressed. Similarly, the average spark-plug temperature suffered a drop. As demonstrated in lab testing designed to simulate a full season of real-world use, AMSOIL SABER Professional Synthetic 2-Stroke Oil provides excellent protection for ECHO* brand string trimmers. SABER Professional outperformed ECHO Power Blend* XTended Life* Universal 2-Stroke Oil by providing improved resistance to piston deposits, crankcase deposits and exhaust port blocking. Due to its ability to limit exhaust-port and spark-arrestor-screen deposits, SABER Professional protected against rpm loss 21 percent better, resulting in reliable operation. The latest generation of SABER Professional meets or exceeds the increased performance requirements of ECHO SRM 225 trimmers. 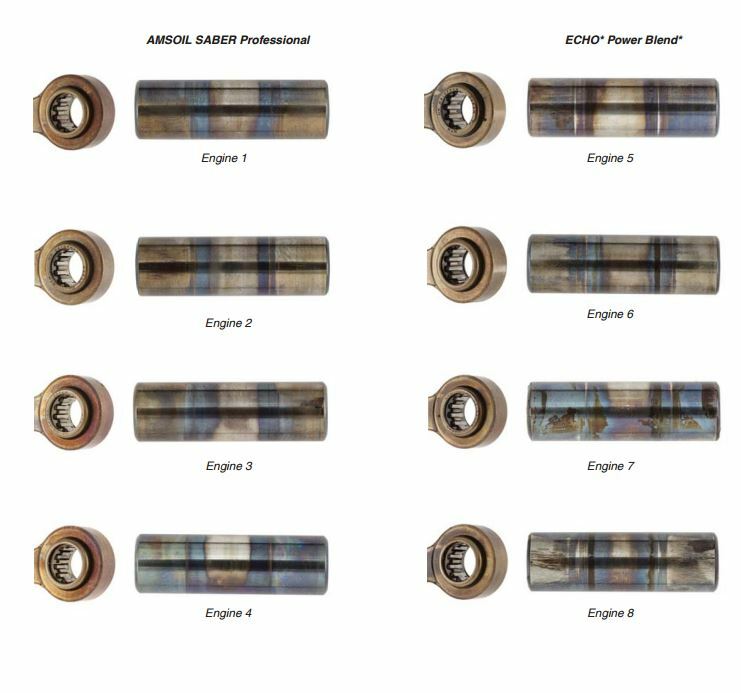 AMSOIL fully supports the use of SABER Professional as a replacement for ECHO Power Blend XTended Life Universal 2-Stroke Oil, and warrants its use according to the AMSOIL Limited Liability Warranty (G1363).